After being hit on the left wrist by Sri Lankan pacer Suranga Lakmal in the second over of the 2018 Asia Cup opener, Bangladesh‘s Tamim Iqbal‘s Asia Cup campaign was cut short when scans revealed that he had fractured his wrist. He has been ruled out of the reminder of the tournament and would be out of action for at least six weeks. He was spotted with a sling after being retired hurt for two. On the field, Bangladesh, after their early struggle, were put back on track by the experienced Mushfiqur Rahim but he kept losing partners and when Mustafizur Rahman got out for 10,that seemed to be the end of the Bangladesh innings at 229. 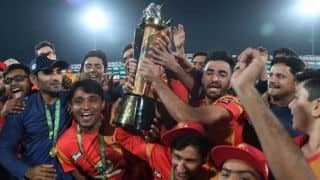 However, Tamim padded up and a cast on his left wrist, and batting gloves tapped to it, walked out to support Rahim and valiantly fought through the pain to play out one delivery with one hand and helped Bangladesh finish at a competitive total of 261. 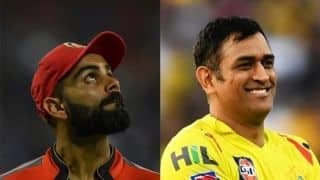 Memories of Anil Kumble bowling with the broken jaw at Antigua and Graeme Smith battling with one hand at the SCG in 2009 were brought back. This has been an emotional ride! Tamim Iqbal batting with one hand and the other hanging out of his glove with a taped wrist. How inspiring is Tamim Iqbal walking out to bat with one hand? This is bravery and commands massive respect! Bangladesh hasn’t been a very likeable cricketing team in the recent years! 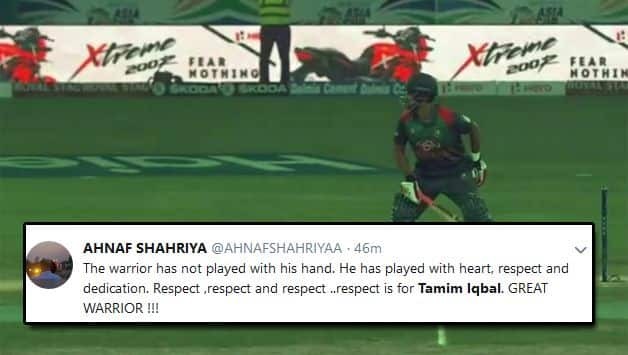 But this act by Tamim Iqbal will have won hearts across teams and fans!